The latest addition to one of the Perth Mint's most compelling new collections, the 2018 1 oz Dragon and Tiger Silver Coin is a must for serious collectors and a very sound investment. It's the second in a series that began with the best-selling Dragon and Phoenix (2017) and it is expected to be equally successful. The 2018 1 oz Dragon and Tiger and its predecessor, the Dragon and Phoenix, are something of a departure from the standard coinage format. Most coins have just one central character, the Australian Kangaroo Nugget or the China Panda, for example, but these have two. The Dragon is the basis of the series and is expected to feature in each new release as it is shown with a range of allies and adversaries. Unlike the phoenix, which has a mutually harmonious relationship with the dragon, the tiger competes with the dragon for supremacy. These majestic creatures have been inextricably linked in Chinese culture and mythology for thousands of years as they play out their never-ending battle. 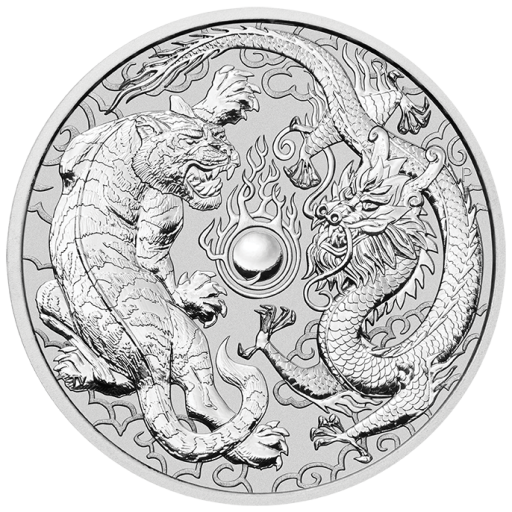 Their quest for the ever-present flaming pearl is beautifully depicted on the reverse of the 2018 silver 1oz Dragon and Tiger coin; the positioning of the animals denotes the tiger's Yin, an endurance and strength that is associated with the earth, and the dragon's Yang, a heavenly force of energy and power. Each creature has been meticulously realised by the Perth Mint's artists and captured for eternity on fine .9999 silver. The obverse of this outstanding silver coin features the Sir Ian Rank-Broadley portrait of HM Queen Elizabeth II. Why choose the 2018 1 oz Silver Dragon and Tiger? The Dragon and Tiger silver coin will be a striking addition to any collection as well as a safe investment that is guaranteed to quickly increase in value. The 2018 1oz Dragon and Tiger coin is expected to sell out quickly so do order now with coininvest.com. Coins are despatched in plastic capsules, foiled trays of 20, or boxes of 300.